For an organized youth bedroom, look no further than this dressing bench. Made with one drawer and one shelf, this piece is perfect for storing shoes, sports equipment, toys, or dress-up clothes. Constructed with English Dovetail joinery and full extension, ball bearing drawer guides, the drawers are sturdy and easy to use. This piece features raised panels on the side and solid iron drawer pulls for a touch of style. 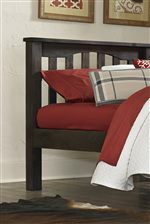 Crafted of solid pine wood, this piece offers a casual and cozy atmosphere while providing extra storage. The Highlands Youth Dressing Bench With Drawer and Shelf by NE Kids at Stoney Creek Furniture in the Toronto, Hamilton, Vaughan, Stoney Creek, Ontario area. Product availability may vary. Contact us for the most current availability on this product. Create the perfect sleeping space for your child with the Highlands collection. 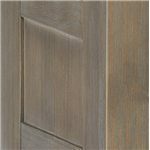 Made with solid pine and completed in an understated driftwood or espresso finish, this collection can create any atmosphere, from a rustic beach, ski chalet, or modern loft. The unique DURA-Brush finishing process makes these pieces last for years to come. 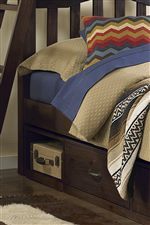 These items include eye-catching details such as panels, planks, block feet, and solid iron drawer pulls. Featuring several bed options with trundle or storage, this collection allows your daughter or son to choose exactly which piece suits them best. This grouping also includes other storage pieces, such as a dresser, chest, and night stand. For a fun, inspired, and comfortable youth bedroom, look no further than the Highlands collection. The Highlands collection is a great option if you are looking for Industrial Transitional furniture in the Toronto, Hamilton, Vaughan, Stoney Creek, Ontario area. Browse other items in the Highlands collection from Stoney Creek Furniture in the Toronto, Hamilton, Vaughan, Stoney Creek, Ontario area.